We have all heard this saying before, and it really is a wise statement. If you are reading this article then you are thinking of following that saying. Great for you! You have started off trading on the right foot. You have gotten some training and now you are looking to practice what you’ve learned-but you’ve hit a speed bump. How should you paper trade? Just doing a quick web search pulls up many results for different trading simulators, games, and paper trading platforms. But are these really the best way to practice your trading? Are these platforms just like the real world? Does that matter? Let’s take a look at the different methods to paper trade with pros and cons for each. When searching the web, simulators and trading games are probably going to be at the top of your results list, but what are they and how do they work? Well they really are just what their titles suggest-simulators or games. Often these platforms are designed not so much for testing a strategy or specific trading style, but to get you interested in the market and let you practice general concepts. These platforms typically let you practice using fictitious or historical data. This data works fine for just messing around a bit, but is not really a good simulation of actual trading conditions as you won’t be watching the market unfold before you. These simulators also often cost money. Now a few dollars a month may not seem like a lot, but a penny saved is a penny earned and by spending that money on a simulator, that’s money that you aren’t putting in your trading account or spending on education. If you are new to the markets and just looking to poke around a little a simulator might not be a bad idea. However, if you are looking to actually practice a specific strategy against the market and simulate what it’ll be like when you “go live”, I’d probably stay away and keep looking. The next main type of paper trading is through the use of the tools provided by your broker. This method is absolutely a step in the correct direction and has some very valuable advantages. First, you’ll be using the exact same features and tools that you’ll be using when you go live. By the time you are live you will already be 100% comfortable with your brokers platform and will not have that learning roadblock in your way. Also, the stock data you receive is much more current. Often it’s live data or maybe delayed by just a few minutes. This allows you to test your strategies and plans in an almost “live like” situation. Your broker’s tools are also most likely free! The goal of your broker is for you to start trading with them so they can collect trade commissions from you. Because of this they quite often provide their paper trading platforms for free. There are a couple downfalls with using your broker’s platform though. These will vary from broker to broker so you will want to check how your broker handles paper trading and not just take my word for it. One of the most popular trading and paper trading is TD Ameritrades ThinkOrSwim (TOS) platform and their PaperMoney. TOS is truly a fantastic platform for trading and can be quite complex so getting comfortable with it in a paper trading environment is not a bad idea at all. However, the big issue with using the PaperMoney platform for practicing is the fills that you get on your orders. What do I mean by this? Well, first you need to understand the spread (you can read more about the spread here). Basically the spread is the difference in price between the bid and the ask for any given security or stock. This spread can be as little as a cent or two or as large as several dollars. Typically, when you are trading with real money you will get filled on either the bid or the ask. So lets use an example. If the bid on a particular stock is $10.00 and the ask is $10.10, when you buy 1000 shares at the ask of $10.10 you are already under water on your purchase by $100 because you will only be able to sell those shares at the current bid, which is $10.00. Now your plan or strategy thinks the stock will go up in price which will allow you to eventually sell for a profit. However, you still need that stock to move at least 10 cents in your direction to be back to break even. When using the PaperMoney platform on TOS you aren’t filled at the bid and the ask, instead they give you a middle fill, in our example you would have been filled at $10.05. Why is this an issue? Well rather than being at an immediate loss like you would be in real life, you are actually just break even. When you go to sell again you’ll also get a middle fill so you’d be able to get right back out at $10.05. Hopefully you see the issue here, this isn’t a very realistic scenario, as you will very seldom actually get a middle fill in real life and should never rely on it. All in all, your brokers tools are not a bad idea or way to practice trading. However, you need to make the paper trading as realistic as possible and middle fills make that very difficult. This last option is going to be the most work, but will also be the most realistic method to paper trading. It’s also not very glamorous. When talking about this type of paper trading the terms “spreadsheet” and “pen and paper” can be used interchangeably. When trading with paper and pen you can get the best of both worlds. You can still use your brokers tools for all of your charting and scanning. However, when it comes to order entry you will use your pen and paper. Rather than entering your order with the broker and getting an unrealistic “middle fill”, you write down what the current ask price is when you enter the trade, as well as the date, and how many shares you are looking to purchase. Then when it’s time to exit the trade you can write down the current bid price and figure out what your profit and loss on the trade is. 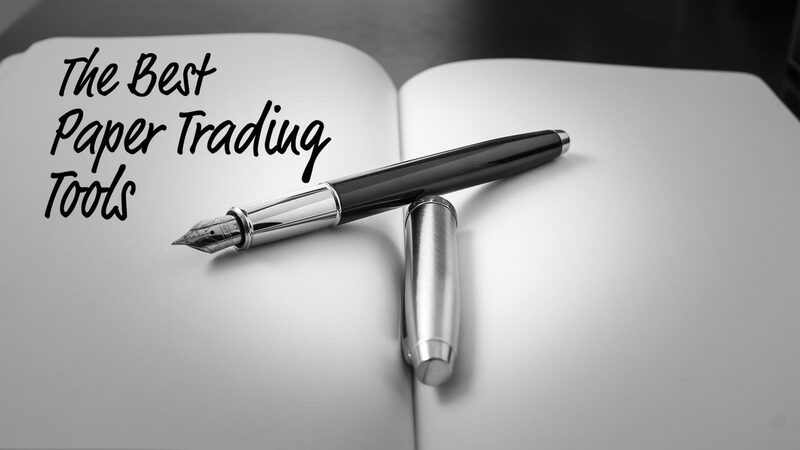 You can also take notes regarding the trade, like the setup you saw, how it reacted when you placed your order, and what you should do differently if the trade didn’t go your way. I strongly recommend the spreadsheet or paper and pen method. I have actually created a free spreadsheet that you can use and a video walking you through how to use it to make your practice trading as realistic as possible. You can find that video and spreadsheet here. All of these methods of paper trading are better than nothing. You should never just jump into the market without testing your strategy first. I use the paper and pen method on a regular basis when I am looking at new setup or strategy, and I strongly encourage you to do the same. It is the most realistic method and it’s also free! If you have any other questions or comments please leave them below, I love to hear your feedback and its extremely helpful to others who may just be starting out.